Running a marathon. Speaking a foreign language. Learning to juggle. All of these things are likely easier than changing a career. That is especially true in digital marketing, where aspiring applicants must hit the equivalent of a moving target because the industry changes so quickly. Do you want my job? Here is the blueprint to take it. But beware that I am doing these things, too, so you might have to settle for working with me. Make up for a lack of experience by marketing yourself. Personal websites are a fantastic way to prove that you know essential digital marketing concepts. Interested in analytics? Create some unique Google Analytics goals that you can discuss in a cover letter. More interested in SEO? Make your personal brand discoverable by updating title tags. A personal website makes up for missing lines on the resume. Writers who have struggled in their career think of Mark Twain, who said, “Write without pay until someone offers pay.” The same lesson applies here. Want to get paid to work in internet marketing? Find a nonprofit or startup that will let you work on their project (and build your portfolio). There is no shame in doing it for free until skills are honed enough to get paid. Read what the experts read. People in internet marketing are not shy about sharing what they know. Take advantage of this by finding the best blogs and publications in your desired niche. Read them. Then find more and read those, too. Contribute to the conversation on social media. Share the things you read and offer additional insight. Even if your analysis is elementary, it shows that you are passionate about the industry and eager to learn and advance. That speaks louder to me as a hiring manager than a degree in marketing or an internship at an agency. Look at the LunaMetrics bio page. Archaeology, library sciences, film?! Our passion for digital unites us, not our educational backgrounds. Use new knowledge to publish something. You don’t need a New York Times byline to publish quality content. Honestly, you don’t even need a blog. A coworker, Michael Bartholow, is fantastic at this. Sure, he writes thought-provoking posts for our widely read blog, but he also publishes micro articles on LinkedIn. This is a clever tactic because prospective employers would likely stumble on these reviewing LinkedIn profile. Tailor LinkedIn profiles (and resumes) to the industry. Let’s be clear: I’m not recommending an embellished work history. Telemarketing is telemarketing so don’t label yourself an Inbound Marketing Strategist. But what did you do last year in addition to telemarketing? If only LinkedIn had certificates, courses, causes, awards, test scores, volunteer work, projects or interests. Those spaces would definitely show a level of interest in digital marketing that could overshadow a lack of experience. Be the go-to on something. As I mention in the post, internet marketing is too vast to be an expert in all of it. Establishing yourself as an expert in one aspect (in addition to a general knowledge on the rest of it) will set you apart from other applicants. 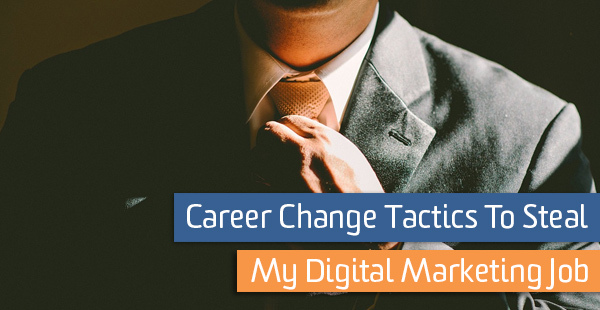 Do you have any career advice for people trying to make a move to digital marketing? Please share it in the comments.